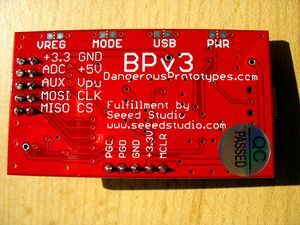 The Bus Pirate is an open source design for a multi-purpose chip-level serial protocol transceiver and debugger. 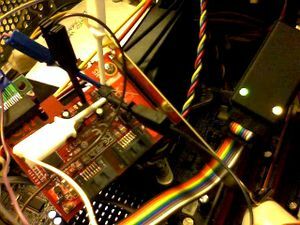 Flashrom supports the Bus Pirate for SPI programming. It also has SPI sniffing functionality, which may come in useful for analysing chip or programmer behaviour. They are available for around US$30 from various sources. The table below shows how a typical SPI flash chip (sitting in the center of the table) needs to be connected (NB: not all flash chips feature all of the pins below, but in general you should always connect all input pins of ICs to some defined potential (usually GND or VCC), ideally with a pull-up/down resistor in between). Most SPI flash chips require a 3.3V supply voltage, but there exist some models that use e.g. 1.8V. Make sure the device in question is compatible before connecting any wires. NB: Some rather rare SPI flash chips (e.g. Atmel AT45DB series) have a completely different layout, please beware. 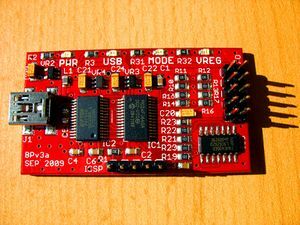 In case of problems probing the chip with flashrom - especially when connecting chips still soldered in a system - please take a look at this page. In circuit programming it often possible, so long as no other devices on the SPI bus are trying to access the device. This page was last modified on 3 April 2013, at 16:21.